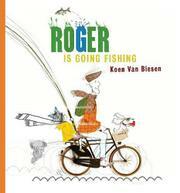 The main characters from Roger Is Reading a Book (2015) are back in this picture book, translated from the original Dutch, about a fishing trip that catches more than fish. Roger, a white man, Bob, a small dog, and Emily, a young white girl, are all assembled on Roger’s bicycle for a trip to go fishing. Emily holds the fishing rod and is sitting behind Roger, who pedals; Bob is in the front basket. As they bicycle through town, Emily’s fishing rod hooks items from the people they pass and each time she yells, “Roger! Roger! I’ve got a bite….” The story builds as the bike becomes loaded down with various captured items including a sombrero, an umbrella, and a skateboard—and, unbeknownst to the bicycle crew, the people whose things were hooked are chasing behind. Reminiscent of Mr. Gumpy’s outings, Van Biesen’s simple text is witty in its build and its denouement, but his mixed-media illustrations may be difficult for young readers to warm up to. All the people illustrated (all white but for one) are preoccupied-looking adults or teens in profile. Emily, with her strangely vacant expression and siren-red lips, is oddly stiff, and readers would be forgiven for thinking Roger is bicycling not with a child but with a (rather creepy) doll perched behind him.